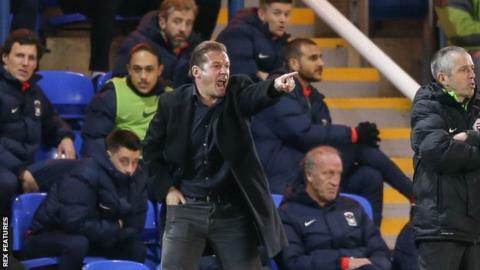 Peterborough United boss Graham Westley insists his team have the chance to "win some respect back" towards the end of their League One campaign. Posh's play-off hopes were ruined by a recent run of six defeats in seven games, leaving them down in 14th. "We owe our fans," Westley, 48, told BBC Radio Cambridgeshire. "They need to watch football that's fast, flowing, attractive and with purpose. "The goals are starting to flow, which is positive." Despite slipping 13 points adrift of the play-off places with eight matches to play, Westley's side have won each of their last two games and are the joint top scorers in the league. "We've got a sense of responsibility to the football club to give people what they've paid for," said Westley. "Our fans have bought season tickets to watch our team playing and winning at home. "Everyone needs to be aware that we are intent on going on a little run ourselves. We've got the chance to win some respect back." Posh can extend their winning run to three games with victory against a Crewe Alexandra side without a win in 10 fixtures. "Games against lower teams are dangerous this time of year," added Westley. "To win these games you have to estimate the game properly and be ready to go. We'll be ready to go."